Shining Moon is a midrate server. It's very customized with more custom content to come. Download: Shining Moon - Download now! 100/100/10 - MVP Card drop rate is 3x however. But you can set your own between 1 and 100! All official content to 13.2, and custom features. Every account has 5 storages each with 600 space. All official content to 16.1, and more to come. Including 3 custom instances with their own storyline. And alot more moving ones! World Bosses are special monster's that have certain immunities and properties. There is no limitation as to how many rewards will be sent. You do not have to be online or on the same map. There is no level requirement / stat requirement / gear requirement or any other requirement to fight a world boss. 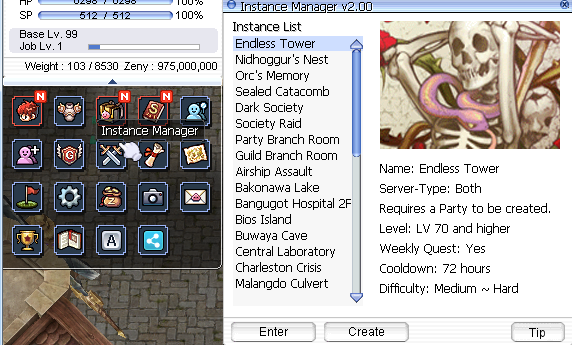 You do not need a party or guild. You will not get multiple rewards for multiple accounts used. Only the highest ranking character will be used. A World Bosses spawns after 500,000 serverwide kills have been reached and a 12 hour cooldown. You can check the status in @go 0. A new World Boss will only spawn after the old one has been killed and the requirements above have been reached. The Soul system is about monster souls and skills. Below max-level, you have a 1.5% chance to seal the soul of a monster when killing the monster. At max-level you have a 3% chance to seal the soul of a monster when killing the monster. Class Change is a unique feature here in Shining Moon. Note: You can only have 1 secondary class per character. Note 2: You can delete your current secondary class for 10,000,000 zeny. If you keep your equipment from either your first or secondary class in your inventory that you wore before switching class, it will automatically re-equip your items on the correct positions. And it will load the new information of the other class that you have. Monster Hunter is a custom feature of Shining Moon. You can complete achievements that reward Monster Hunter Coins. These coins you may exchange for tradeable or untradeable rewards. Each character may complete these achievements only once. - Each Monster Hunt achievements awards 5 Monster Hunter Coin.png Monster Hunter coins. - The Coin exchanger is located inside the Main Office. Over 200 custom Achievements and over 40 custom titles. All the original 3rd class biolab monsters with their drop.